Max Beckmann, 1884–1950, was a painter and print-maker, primarily known for his self-portraits. Although Beckmann railed against being tagged as belonging to any art movement, he is most commonly classified as an Expressionist artist, until his work dramatically changed in the 1920s. Max Beckmann volunteered in the Medical Corps in Belgium as an orderly at the start of World War I in 1914. He was discharged after having a nervous breakdown in 1915, which led to the dramatic transformation of how he depicted himself and humanity in his art. Through his post-war art he sought to save the ”injuries of the soul” he suffered during his service. His trauma led him to create haunting, expressive figures using techniques of distortion and extreme angularity once he returned to civilian life. The National Library of Medicine (NLM) had a unique opportunity to acquire two original Beckmann prints which he created during his recuperation after he was discharged from service. Upon examining them, I heard the silent screams and felt the emotional pain of the figures he created. Without a single word they emulate the crippling effects that the war had on Beckmann, his acquaintances, and his view of the world. The prints were originally part of the private collection of Aaron Sopher, 1905–1972, a Baltimore artist and associate of Beckmann. Sopher’s work currently hangs in the Smithsonian Art Museum and has appeared in the Baltimore Sun, the New Yorker, and Harper’s Bazaar. 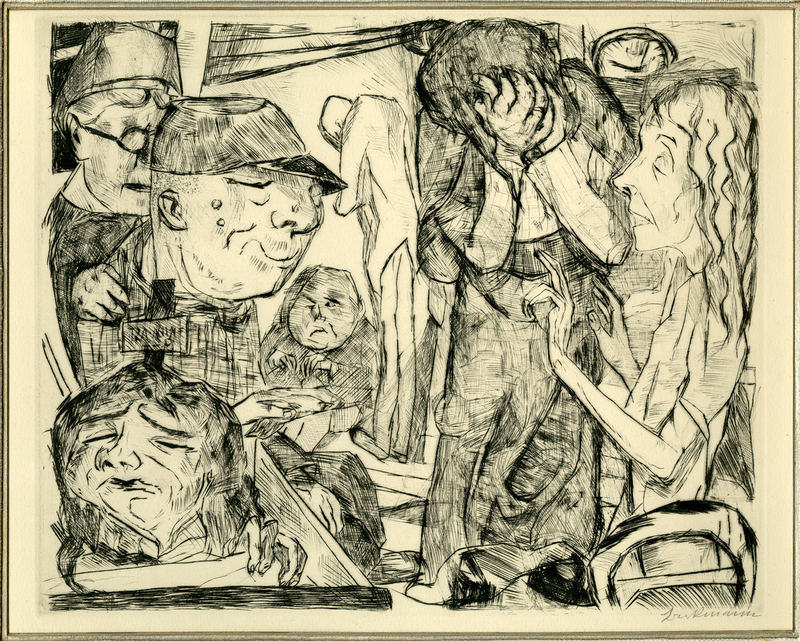 Like Beckmann, Sopher felt a moral responsibility to portray individual devastation in a meaningful manner, although his works were created in America during the Depression. 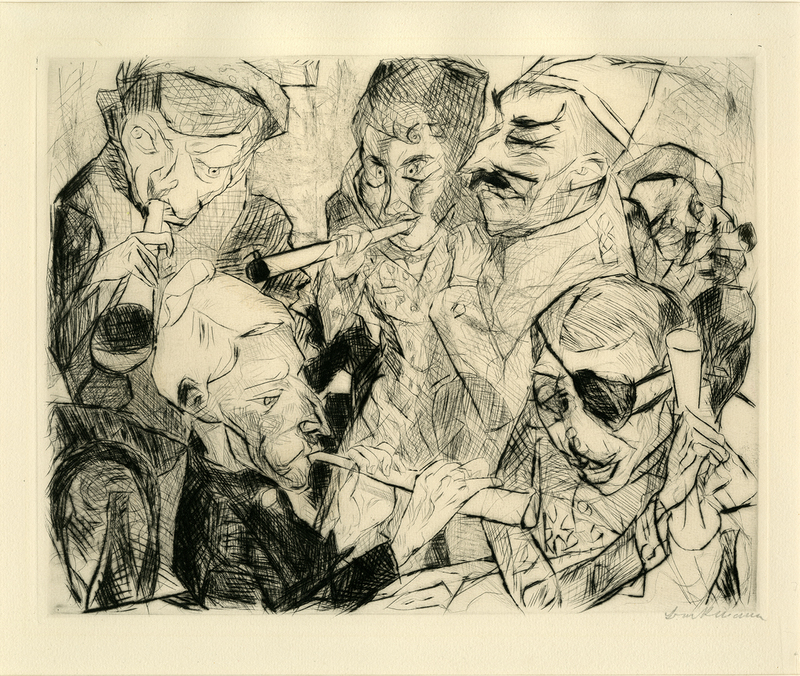 Sopher was also an associate of New Objectivity (Neue Sachlichkeit) artist George Grosz, 1893–1969, a German contemporary of Beckmann, known especially for his caricature drawings and paintings of Berlin life in the 1920s. Beckmann later adopted this style, which emerged in Germany in the 1920s in reaction to post World War I trauma. Artists in New Objectivity rejected Expressionism and focused on an unsentimental reality with a focus on the objective world, as opposed to the more abstract, romantic, or idealistic tendencies of Expressionism. The artists aggressively attacked and satirized the evils of society, including the leadership of the Weimar Republic, and documented the devastating effects of the shattered nation that post-war Germany had become. New Objectivity was not a strict movement in the sense that the artists followed a set of rules. Each artist had a different technique to express realism, but the subject matter covered similar aspects of society including the demoralized atmosphere after 2 million men had been killed in the war, Germany’s economic downfall, social unrest, and the rise of Nazism. It was in 1933, with Hitler’s appointment as Chancellor when the New Objectivity movement ended, along with the fall of the Weimar Republic. The print featured above, Prosit Neujahr 1917 (Happy New Year 1917), was created in 1917 and published in 1919. It is a drypoint on laid paper, signed by the artist and containing a publisher’s blindstamp, both in the lower right corner of the print. It is Plate 17 of (19) of the series Gesichter (Faces). The print is an unnumbered artist proof, a print used to check the progress of prints during their production, and produced especially for the artist by the printer. Despite its seemingly festive theme, this piece reflects Beckmann’s traumatic experience during World War I. In this setting, most likely a private infirmary for officers, six distorted individuals are blowing horns, each with a vacant or maniacal expression on their face. Beckmann’s figures are drawn with dramatic angles and exaggerated facial features to draw forth the intensity of their emotion. The man in the lower right corner is thought to be Beckmann’s friend Ernst Guthmann, whose black eye-patch is evidence of the severe injuries he suffered during the war. The second print acquired by the Library is Irrenhaus (Madhouse), created in 1918 and published in 1919. This print is also a drypoint on laid paper, signed by the artist on the lower right corner and containing a publisher’s blindstamp on the lower left corner. It is Plate 3 of (19) of the series Gesichter and is one copy in an edition of 60. During Beckmann’s recuperation, the overcrowded, claustrophobic manner of representation he favored in many of his images from 1916–1917 is evidenced here by this presentation of a cluttered room of monstrous, mask-like figures. The seven severely distorted figures occupy a very small space, yet each one seems to be independent of the other, as if they are alone in the room. The dramatic lines and exaggerated facial features demonstrate intense emotional distress, loneliness, and insanity. In the upper left corner is an accurately drawn figure with glasses who has a hand on the shoulder of a person, possibly a patient, and therefore may be a hospital attendant. In the center, there is a male with his face hidden in his hands, looking thoroughly tormented. The historical significance of these prints stretches beyond the fact that they are a physical record of the mental and physical impact World War I had on the individuals who served. In the early 1930s, the National Socialist Press in Germany began to attack Beckmann’s work, and modern art in general. In 1933 Hitler was appointed chancellor of Germany and at this time Beckmann was teaching art at the Städelschule, an art school in Frankfurt. He was promptly dismissed from his teaching position, and subsequently his paintings were removed from view at the Berlin National Gallery. Shortly thereafter, Beckmann left Frankfurt and returned to Berlin just as Adolf Hitler’s antagonism toward modern art was becoming more hostile. In 1937 nearly 500 of Beckmann’s paintings were seized from museums in Germany. They were displayed in Hitler’s Entartete Kunst (Degenerate Art) exhibition, organized by the Nazi Party in Munich from July 19 to November 30, 1937. Beckmann immediately left for Amsterdam, where he lived throughout World War II. He remained active there, still painting, and in 1947 he came to America, where he taught art in St. Louis at the School of Fine Arts at Washington University, and then later in New York at the Brooklyn Museum Art School. In December of 1950, Beckmann died of a heart attack while walking to the Metropolitan Museum of Art to see his Self-Portrait in Blue Jacket (1950) on display, only one day after he finished his final painting, Argonauts (1950). Having learned that so many of Beckmann’s prints were stolen in 1937, I was curious whether other copies of the Library’s newly acquired prints had also been confiscated. I cross referenced the artwork from a database of stolen art that is online at the Free University of Berlin, with an actual digitized version of the inventory of confiscated paintings, and their fate, that is online on the Victoria & Albert Museum website. This inventory was produced by the Reich Ministry for Public Enlightenment and Propaganda around 1942 as a final record of what the Nazis had stolen. As it turns out, copies of both Prosit Neujahr 1917 and Irrenhaus were stolen from three museums. One each from museums in Chemnitz (Kunstsammlungen Chemnitz), Dresden (Kupferstich-Kabinett), and Frankfurt (Städel Museum). The copies from Chemnitz are marked in the inventory as destroyed. The other copies, stolen from Dresden and Frankfurt, are marked as sold, and their current whereabouts unknown. Access to these prints is provided through LocatorPlus, the Library’s online catalog. For questions about these prints and other historical collections, including how to consult them, please contact the History of Medicine Division Reference staff at NLM Customer Support or call (301) 402-8878.